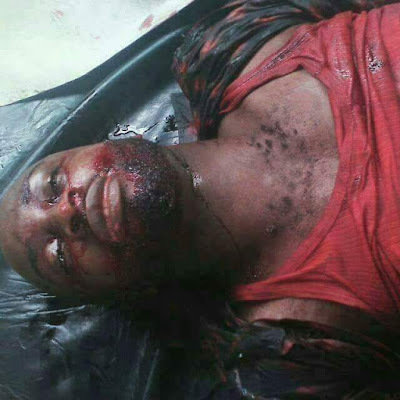 Friday Nduka who just returned from Malaysia for his wedding in Owerri was reportedly shot dead on December 22 by a trigger-happy policeman, who is now at large, in the presence of his fiancée and younger brother. Nduka who hailed from Oguta Local Government Area of Imo State was supposed to have his wedding on December 27, 2016. An eyewitness told Punch correspondent that Nduka got into in a serious argument with one of the pump attendants over his missing iPhone 7. He said the argument degenerated into a fight and Nduka, inflicted injuries on the attendant. The witness said the manager of the station, Mrs. Ruth Enemmuo, who is now in police detention, intervened, adding that as soon as Nduka entered into his car, the police inspector, Mike Edem, who was on duty at the station fired, killing him instantly. It was learnt that the inspector fled the area and had not been seen. The manager later went to the police station to report the killing, but was detained immediately. The woman, who spoke to Punch correspondent from her cell, said all the station’s attendants, including the one that had an altercation with the deceased, were on the run. The state Police Public Relations Officer, Andrew Enwerem, confirmed the incident and described the inspector as unruly. Enwerem stated that the Inspector-General of Police had mandated the Commissioner of Police, Taiwo Lakanu, to apprehend the fleeing inspector.